Let’s see how many shares we can get for justice for this family and awareness. Because of negligence by medical professionals, Robert Darren Powell [Robbie] died on April 17, 1990 at the young age of 10. Four months before his death, he suffered from all the classical symptoms of Addison’s disease or Adrenal Insufficiency. 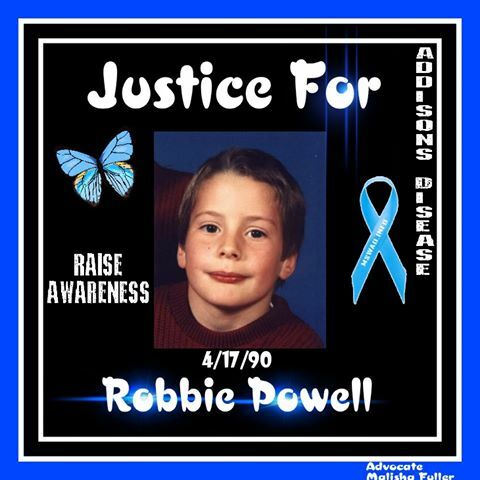 Robbie had suffered from an Addisonian crisis and almost died in December 1989 when he was admitted to hospital as a medical emergency. The medical professionals suspected Addison’s disease and ordered the ACTH test but did not share this information with his parents who would have ensured the test was carried out. Instead, the physicians blamed Robbie’s symptoms on gastroenteritis, which was untenable in the absence of diarrhoea, the high potassium, low sodium and low blood sugar. Robbie was seen by 5 different doctors, on 7 separate occasions, in the last 15 days of his life. He was seen by 3 doctors, 4 times, in his last 3 days. Although the young boy was obviously unwell not one physician performed blood tests or even checked his blood pressure during this period. The medical physicians failed Robbie by not referring the child to a specialist, as requested in the medical notes. They also failed to admit him to the hospital to evaluate his condition thoroughly until it was too late to save his life. An Addison’s patient does not produce sufficient amounts of the hormone cortisol so therefore needs daily steroids to maintain life. Infection, stress, injury and surgery for Addison’s sufferers require additional steroids.